Sooner or later the VTGOP will have to address Rutland | The Vermont Political Observer. First, Rutland is a Republican city. It’s arguably the strongest Republican redoubt in the state, and it plays an outsized role in the VTGOP. Second, refugee panic is a predominantly Republican phenomenon. After all, Donald Trump is the party’s standard-bearer. 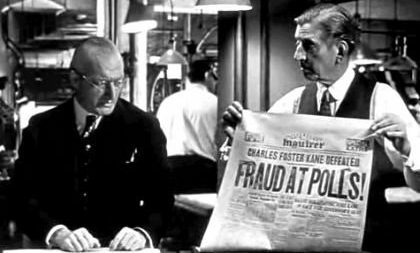 He won the nomination fair and square, by trouncing a boatload of high-profile hopefuls. He resurrected “America First” from the ignoble ashes of pre-World War II conservative isolationism. The local activists didn’t choose “Rutland First” because it came up in the alphabet soup. No, it was an echo of Trump’s populist nativism. And whether Vermont Republicans like it or not, Donald Trump is the party’s leader, and the vast majority of them will vote to install him in the White House, race-baiting and all. And Trump didn’t appear out of thin air. There’s been a strong nativist strain in Republican politics since at least 1994, when California Governor Pete Wilson committed his party to institutional rabble-rousing by way of Prop 187, a proposed clampdown on undocumented immigrants. We welcome refugees, asylum seekers and other immigrants to our communities and value their contributions to local economies. So yeah, the Dems are on record. They didn’t specifically mention Rutland, but they made it clear where they stand. As for the Progs, there is nothing in their track record to indicate anything other than strong support for refugee settlement. Benning and various Rutlanders also object to any nativist or racist characterization of the opposition. They are merely concerned about Mayor Louras’ non-inclusive process, and earnestly seek more information about the plan. Which I could buy, if they didn’t say something patently racist every time they open their damn mouths. (See Paul Heintz’ “Fair Game” column for some priceless examples.) And if they didn’t seem less interested in real information than in rabble-rousing at every turn. While one can contest the Mayor’s approach, nothing was settled at the time and the process has been wide open for a while now. There have been opportunities galore to get real answers to any valid questions. The problem is, the opponents won’t accept any information that doesn’t validate their prejudices. City Treasurer Wendy Wilton has assured us that she is not running for mayor. Whether it’s her or not, two things are clear. One, there will be an anti-refugee candidate challenging Louras and some incumbent Aldermen. Two, Wilton has been energetically demagoguing the issue. Her claim that 100 refugees would create a massive burden on Rutland taxpayers is based on exaggerating every possible worst-case scenario. It appears to assume, for instance, that none of those refugees will find jobs or create new opportunities. In fact, the vast majority of refugees want nothing more than to create a new and productive life in America. They are grateful for the opportunity. The newest Americans, indeed, are strongly entrepreneurial. Rutland would be more likely to see a falafel truck on every corner than bands of idle Syrians roaming the streets. Small sample size, but the point is, most of those refugees will be economic assets for Rutland. If Wendy Wilton was interested in real information, she’d take that into account. Closer to home, she could heed the words of her own police chief Brian Kilcullen, who says the refugee plan is “a nonissue” for public safety. He should know, he’s a former police chief in Schenectady, New York, which has re-energized its Rust Belt economy by welcoming immigrants from Guyana and refugees from Afghanistan. The unsupported arguments are repeated loudly. 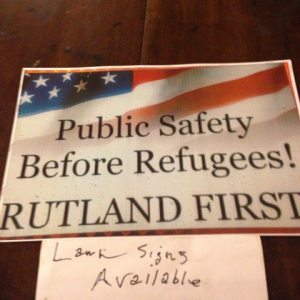 The mounting evidence that Rutland would see a net gain from the Syrian refugees is ignored. Fears are stoked. The Rutland Firsters are a stain on Vermont’s reputation for tolerance, a reputation that goes back to the days of slavery. Sooner or later, the Republican Party will have to take a stand. If for no other reason than the fact that powerful figures like Wilton are involved, and the area’s many Republican lawmakers will be forced to weigh in. Again, right on track John. It would be easy to determine if communities who have welcomed refugees have seen a substantial increase in taxation based on the arrival of the refugees alone. Do taxpayers in Winooski or Burlington pay additional taxes to help support refugees? How many businesses in those two cities are owned by refugees? Does the Lake Champlain Regional Chamber of Commerce find refugees a liability or a positive? By asking a few questions, Rutland First would quickly figure out that they are not first or second, or even third, they are simply the next community to welcome hard working families to join with them to create an even better community. Spreading fear is not a solution to any issue.